How often do you feel the “Sunday scaries”? You know that feeling that starts creeping in around midday every Sunday that’s followed by all out panic by Sunday night? That’s the Sunday scaries. For me, the Sunday scaries came on because it meant another week was about to start with the same panicked race to get everything done for that day. No matter how hard I tried, I couldn’t get ahead. When your to-do list is so long and overwhelming, you ultimately stop doing it, which means forgetting important things, which means more anxiety about which important things you’re forgetting: the ultimate teacher conundrum! If you’re nodding your head in agreement, then you are probably like me in that our cute stationary, matching folders for make-up work, and expensive teacher planners just aren’t cutting it. On the surface, it might look organization, yet the productivity isn’t boasting the same results. It wasn’t until I was introduced to productivity great, Stephen Covey, that I started making headway. It was the kick start I needed to evaluate my own productivity. I devoured many organization and time management books and podcasts. I finally started seeing progress and feeling better. Really, the whole point of this pursuit (I can say in retrospect) was presence. I wanted to be present in all of my roles in the moment and after the fact: teacher, leader, colleague, researcher, writer, friend, daughter, and wife. Through this pursuit, I’ve done a lot of reading (books, articles, professional development, etc.) and listening (podcasts, documentaries, family, friends, moms, students, etc.). Since then, I’ve reduced my stress tenfold. I don’t suffer from the Sunday scaries anymore, and while there always are going to be bad days, I have far more good than bad. I owe much of this success to my productivity because I get done what I absolutely need to get done today. Then, I know what I have to do in the near future. Finally, I eventually achieve what I want to do someday (read: the summer). Most importantly, I don’t stress about any of them, so I can be present in all of my roles. It’s a much better way to live. And now, I want to help you do the same. Three categories make up this plan: do today, do this week, and do soon. 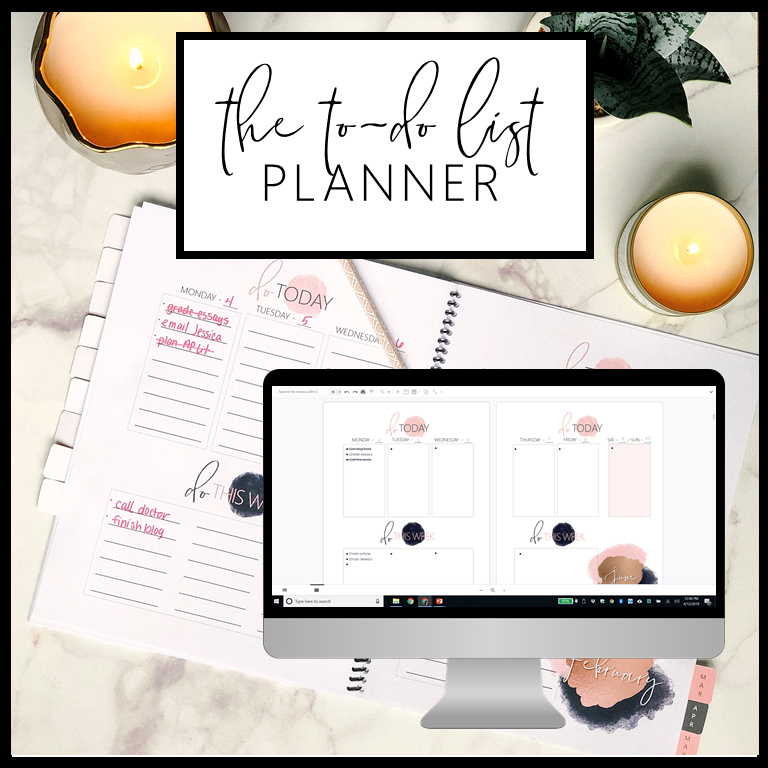 You can use the print planner I created, the digital planner that comes with it, or you can create your own. When I’m recording these items, I don’t take a lot of time to write a detailed description of each. I write only enough to remind me of the thing I need to do. For paying a bill that’s due today, I would write, “pay bill.” For making copies for the test I’m giving tomorrow, I would write, “make test copies.” The goal is to make this as quick, painless, and productive as possible. The key to make this plan work is to establish a routine. Create your do today list at the same place and time every morning. For me, as soon as I get to work, I love sitting at my desk in my quiet classroom and writing out my daily list. I admittedly also keep the door shut with the lights off to avoid distractions and interruptions until I’m done. This might work for you, or maybe once you get to your classroom you’re too distracted. If this is the case, it might be wise to sit in your car in the parking lot and complete it then. Perhaps, you want to write it out the night before to get it out of your head and onto paper. You have to do whatever works for you to create a routine you know you will stick with. It only takes about five minutes, so find your five minutes when you know you’ll be able to focus every day. The do this week category is for one of two items: 1) things you’d like to get done today but aren’t a necessity and 2) things that are coming up this week that you have to do but are necessary to do by the end of the week. For example, if your grades are due by Friday and it’s Monday, put it in the Do this week category. You know you need to turn in the grades by Friday, but you must get the final essays graded first. The reason we put these items here is so that you remember you have to do them, but you aren’t distracted by them like you might be if they were on the do today list. Once your do today list is crossed off, the do this week items are fair game. This helps you prioritize to get those nonnegotiable do today things done before jumping to any of the items on the do this week list. Being teachers, we can so easily get caught up in creating an activity that we’re excited about for next week, forgetting that we have essays to grade to give back tomorrow. This strategy helps me work on the nonnegotiable items (that might not be as fun), but need to be done before I spend time working on items for next week. Therefore, it should help to motivate you to get those DO today things done quickly, so you can tackle any of the do this week items you really want to do. The do Soon section represents items that you know you won’t be able to get to today or this week or maybe even this month, but you don’t want to completely forget about them. This category is something that is usually left off of our traditional to-do lists because it wouldn’t be something that could be crossed off anytime soon. This is an important list, nonetheless, because it represents your big goals and ideas. It also represents the tasks you know you will need to complete in the future but you are waiting on too many other steps before you can accomplish the big one. All of these items are too important for me to forget, but they aren’t imminent this week. Right now, I simply don’t have the time to remodel my bathroom. We’re going to tackle that one this summer when we’re off. (My husband is a teacher too.) I have to meet with two other people who are involved in the study before I can start writing the article. We have six boxes of books in the basement that we’re going to donate to the Kiwanis club but the sale isn’t for another month. So you see, if I put these items on a traditional to-do list, they needlessly would complicate my to-do list. Yet, I don’t want to completely forget about these things. If you’re like me, it’s all about consistency. This means I need to have a planner instead of trying to do all of this on sticky notes. (And it’s also a perk when it looks nice!) I created The To-Do List Planner for that reason. You’ll receive a .pdf file that can be printed and bound. Or, you can use the digital planner that I created in Google Slides. The digital option can be used on both your computer and your cell phone. 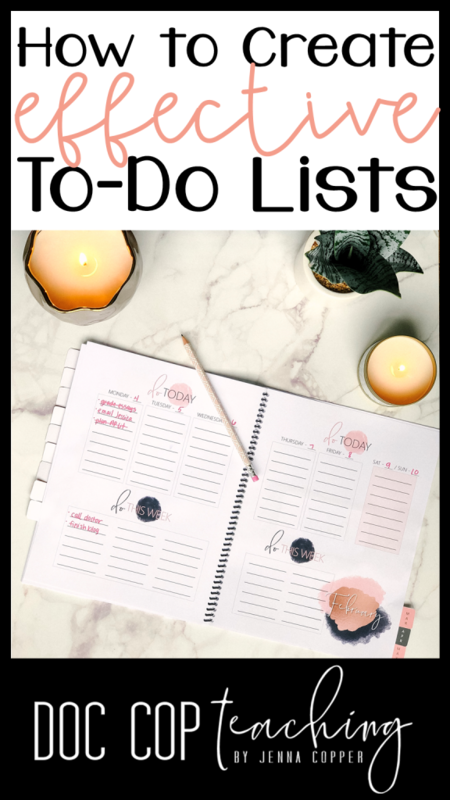 You can find The To-Do List Planner here. Breus, M. (2016). The power of when. New York: Little, Brown and Company. Johnson, Chalene. (2018). The Chalene show [Audio podcast].